That was a quick look at our new brand campaign, which kicked-off December 31. I hope you like it. As the number one retail brand, Toyota is already going places, and it’s just going to get better as we invite our customers along for the ride with more exciting and innovative products and services. Good afternoon everyone, and thanks for joining us today. Attending the North American International Auto Show is always something to look forward to especially when there’s a great concept car like we have today. The Detroit show comes right in the middle of an automotive dream come true. 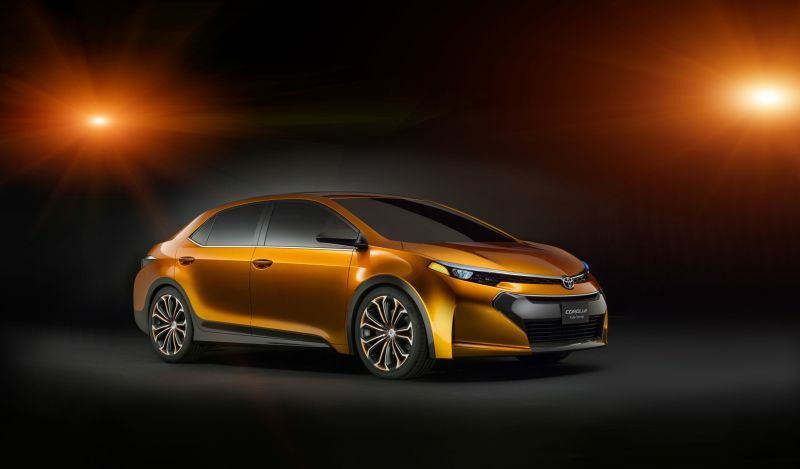 Toyota and the rest of the industry enter 2013 with a great deal of excitement. Business was great in 2012 as the industry came in at 14.5 million units, the best since the landmark year of 2007. With anticipated improvements in consumer confidence, unemployment, the housing market, interest rates and an avalanche of pent-up demand, we see the market expanding again this year. Looking back on 2012, Toyota, Lexus and Scion dealers sold more than 2 million units for the first time since 2008, with an increase of 430,000 over the previous year, which is the largest of any manufacturer in the last 20 years. The Toyota Division sold over 1.8 million, up 27 percent, for the best year since ’08, and our position as the number-one retail brand reflects consumer confidence in Toyota. Camry topped 400,000 sales for the first time in four years, and it remained the best-selling car in America for the 11th straight year and 15 out of the last 16 years. Corolla was our second best-seller, and the Prius Family was third, with a growth of more than 100,000 units. Best of all, we’re off to good start in 2013 with dramatic new products and more on the way. While we expect to see the new Avalon and RAV4 grow significantly in their segments, we also see an opportunity for growth in the compact segment one that has always been a major part of Toyota’s product strategy. Over the years, Toyota has sold 40 million Corollas worldwide, making it the best-selling nameplate on the planet. Closer to home, 2013 marks the 45th anniversary of Corolla in the U.S., where we’ve sold more than nine million since 1968. That’s more than the total individual population in 40 of the 50 states, with over four-and-a-half million still on the road today. Or you can look at it this way Toyota Division has sold 24 million passenger cars since 1968 and about 38 percent of those have been Corollas. Through 10 generations, Corolla has always been a popular choice for car buyers. Not only was the current model – introduced in 2008 – the second best-selling car for Toyota last year, it was also number two in the compact segment, which has grown significantly with many all-new entries. Last year, there were 2.1 million compacts sold in the U.S., and Corolla accounted for nearly 300,000, a 13.5 percent segment share. I was talking the other day with Greg Penske and Tom Rudnai, the guys who make Longo Toyota our biggest and most successful dealership every day. They mentioned how extremely important Corolla is for their dealership. It represents over 22-percent of their passenger car sales, second only to Camry. And it brings in a lot of first-time and pre-owned buyers. Corolla’s importance to Toyota isn’t just about sales…it’s also about jobs and investment. Corolla has been built in the U.S. since 1984, when it was the first vehicle off the line at the NUMMI plant in California. Today, more than 97 percent of the Corollas sold in America are built at our plant in Cambridge, Canada and our new dedicated plant in Blue Springs, Mississippi, which opened in the fall of 2011. By the end of the year, 100 percent of the Corollas sold here will be built in North America. Compact buyers expect good fuel economy, quality and value for the money, which Corolla has provided U.S. consumers for 44 years. Today’s younger buyers value those things… but they also want more dramatic styling and new technologies, like we’re providing with Camry, FR-S, Avalon and RAV4. For example, the Camry SE – with expressive styling, a sporty interior and a sport-tuned suspension – now accounts for 40 percent of sales with a media age of 44, dropping overall Camry age by nearly 10 years. Because young buyers are returning to the market at a faster rate than any generation, the next Corolla must have expressive appeal with improved styling that elicits surprise and excitement. What might that car look like? For an idea, let’s take a look into the future. As the name “Furia” suggests, this concept vehicle has a “ferocious” look and a “fury” of energetic design elements. There are a lot of words designers use to describe it, but just let me say it’s a great looking car. 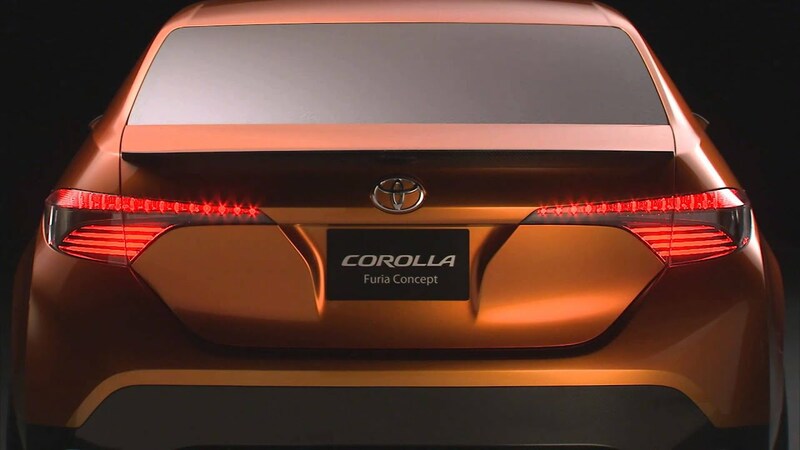 And I’m sure it will cause some surprise from those who may have preconceived notions about the future of Corolla. 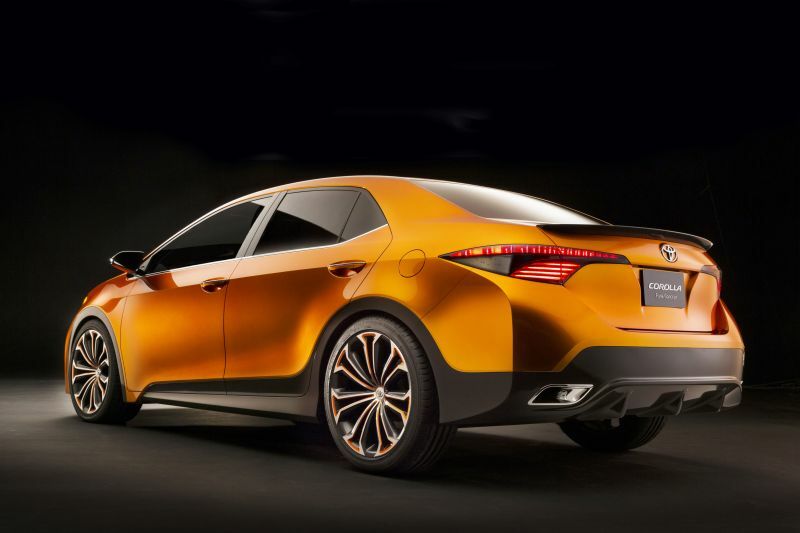 The Furia is a dynamic compact-sedan interpretation, with short overhangs to emphasize a long wheelbase. Furia is designed around a theme that uses pure and simple surface elements to create a confident, more decisive appearance. After the sizzling color catches your eye, the aggressive front fascia dominates with a blacked-out grille and carbon fiber lower spoiler. The carbon fiber treatment extends down the rocker panels and rear valance, finishing with an attention-grabbing rear spoiler. The ultramodern, yet aggressive, 19-inch alloy wheels are pushed out to the corners to enhance the Furia’s stable stance. Sculpted front LED headlamps and rear composite LED taillights give the vehicle a technologically advanced image. While Furia is clearly focused on the exterior, our designers are also pushing the envelope on interior styling that will surprise a lot of people, with roominess, comfort and premium materials. 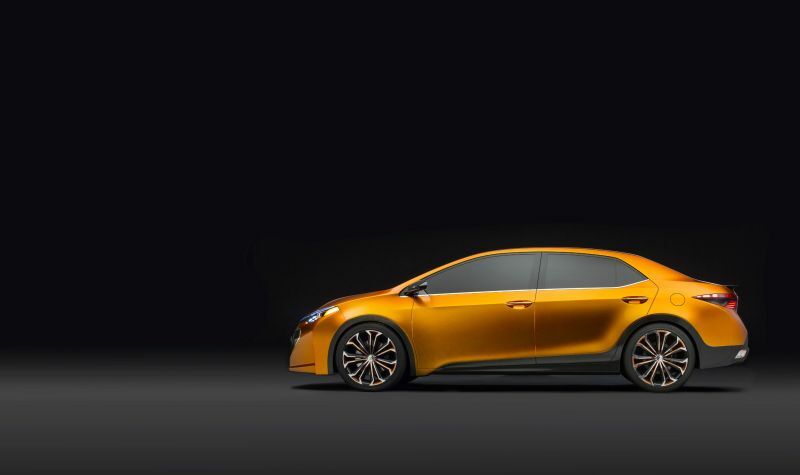 It’s only a concept, but the Corolla Furia sends a clear message where we’re going in the future. Not only will the styling be more expressive, but it will also reflect our overall approach to the compact segment in every way. As the Furia name might imply, we’re “furiously” working on future products, so our customers can “go places” in style, comfort, safety and connected to their world. 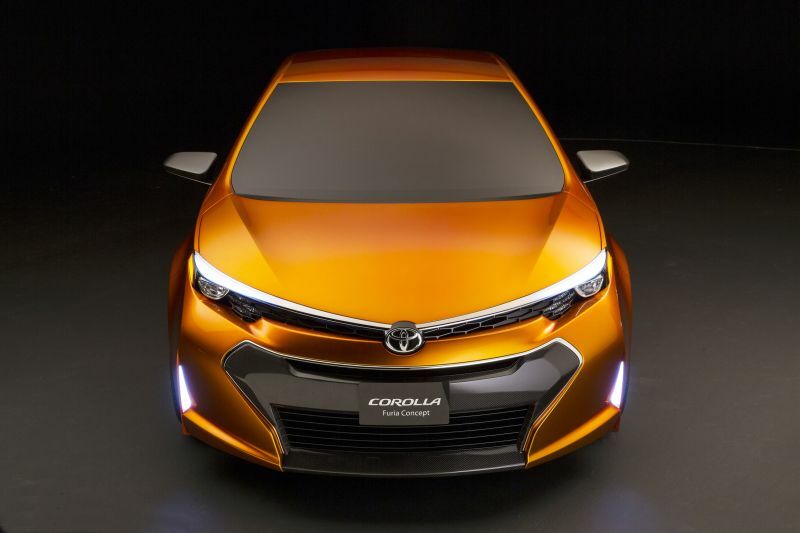 I invite the photographers up first to take some additional images of the Corolla Furia Concept. Enjoy the rest of the Detroit show.